Dual Layer form-fitting shockproof wallet case specially designed for 4.7” iPhone 8. Please note it can’t fit 5.5” iPhone 8 Plus. Soft shock absorption inner TPU sleeve & impact-resistant hard shell provide outstanding protection against drops and other impact. Durable silicone material that resists moisture stretches to fit over your iPhone 8. Built-in Flip-out stand provides ultimate flexibility and convenience allowing you to watch videos and movies with enviable comfort. Please note the card holder could only store one card at most. 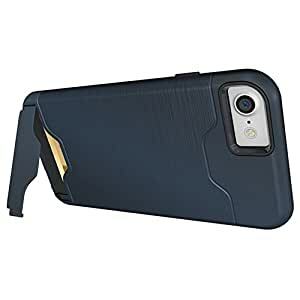 This metallic Hybrid card case is made from separate polycarbonate and TPU layers that come together to offer extra durability and shock absorbency, which provides long lasting protection against drops, knocks and scratches for your phone. The outer hard polycarbonate layer features an attractive brushed metal effect for the perfect finishing touch. The softer shock absorbing TPU layer is designed to take all the beating everyday wear and tear can throw at it – including drops from over a meter. The two come together to not only form an irresistible barrier against damage but also look great, with a the two materials offering contrasting yet complementary aesthetics. The case features a non-slip texture that provides you with extra grip for your phone, which minimizes the chance of dropping your device – meaning this case is professional enough for work and sporty enough for play. If you plan to be out and about, if you’re commuting or on your holidays but still need access to your credit or debit card, license or identification, and you want to travel light – look no further than this case with its exterior card slot. With safe and secure storage for the cards you most need on any given day, you can keep everything you need for your travels in one place. So leave the regular wallet at home if possible – this case has it covered. The hard attachable exoskeleton doesn’t just add strength to the shell, but features an ergonomically designed stand that pulls out to give the perfect viewing angle for videos and pictures. The stand then simply clicks back into place and lays completely flat so there is zero bulk added to the case.